First of all, this is not a new product. 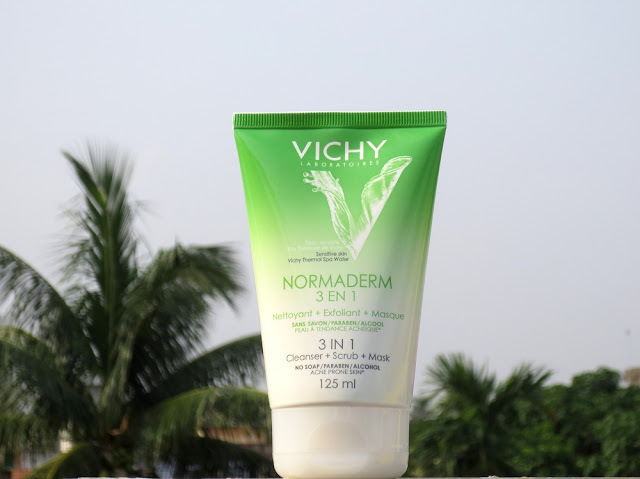 Vichy launched this Normaderm 3 in 1 Cleanser+Scrub+Mask long back. At that time, almost every brand was coming up with these multi-tasking products. While the others are done and dusted, Vichy still stands strong. Packaging: It is a plastic tube with flip top cap. Texture: Smooth granules in paste type base. 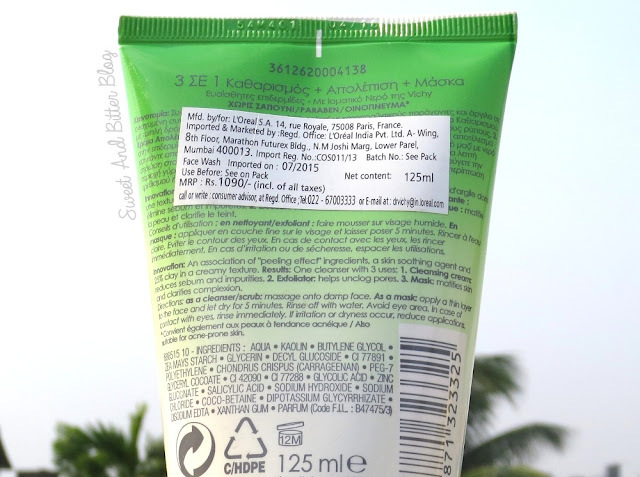 Ingredients: Contains clay and other soothing ingredients to benefit sensitive skin. The complete ingredients list is mentioned in the bottle. My Views: As a cleanser, it is a low foaming face wash. But, nevertheless cleans properly. It can be used as a face wash but it is tough to fit it in my everyday skincare routine. As a scrub, it is better. The rounded granules are not harsh but exfoliate skin without any irritation. But, if you have oily skin then you will love to use it as a mask. They recommend to use it as a mask once or at max twice a week (but, I personally do not follow this rule :P) and every time you need only peanut size amount. It absorbs every bit of oil and mattifies skin without drying. In fact, it even keeps skin oil free for few hours. Bless the kaolin in it which makes it soothing for sensitive skin. I love using it after I step in my home after some time under the sun. I feel that it not only cleanses and remove sweat but tighten pores as well. Because of the clay in its formula, it hardens after few minutes when used as a mask. So, while washing off it exfoliates even better. All in all, it is a multi-tasking marvel. I got to try a sample which I got with my purchase from Vichy. The color of the product intrigued me even back in 2014. I do feel they have improved the formula. Now, it is not as drying as it used it be and it now lathers more than it did before. Overall: If you have sensitive skin which gets oily soon then give Vichy Normaderm a try. All their products are specially formulated for sensitive skin. The price tag might seem like too much to spend on a face mask in one go but, the product will last for long. Also, I will suggest that you buy from a store instead of buying online because they generally give many samples at the store.